This history of Sudeley Castle goes back centuries. It’s majestic gardens were once visited by the likes of Richard III, Jasper Tudor, Henry VIII, Anne Boleyn, Katherine Parr and Lady Jane Grey. It 1469, King Edward IV forced a Lancastrian supporter (his enemies) to sell the castle to the crown. Edward IV then granted it to his younger brother, Richard, Duke of Gloucester (future Richard III) who held it for nine years and then it reverted back to the crown because he exchanged it for another castle. When Richard became King of England he once again held ownership of Sudeley Castle. After Richard III was killed at the Battle of Bosworth in 1483, one must assume that the castle became the property of King Henry VII since he now wore the crown. The following year he granted the castle to his uncle, Jasper Tudor, Duke of Bedford who held it until his death in 1495. The castle was once again the property of the crown. Forty years later (1535) the castle must have still been in good condition because Henry VIII and Anne Boleyn stopped there on their tour. The King and Cromwell met at Winchcombe Abbey and planned further dissolution of monasteries together. During this visit to Sudeley Anne Boleyn is also noted to have investigated the “Blood of Christ” at Hailes Abbey which, if I remember correctly, turned out to be duck’s blood. In 1547, when Thomas Seymour was raised by his nephew Edward VI to Baron Seymour of Sudeley he obtained the sprawling castle in need of desperate up keep. It is unknown how much Seymour spent on renovations on the castle but one can imagine it was a small fortune; He was preparing for a dowager queen to be present and their home together to be like a second court. 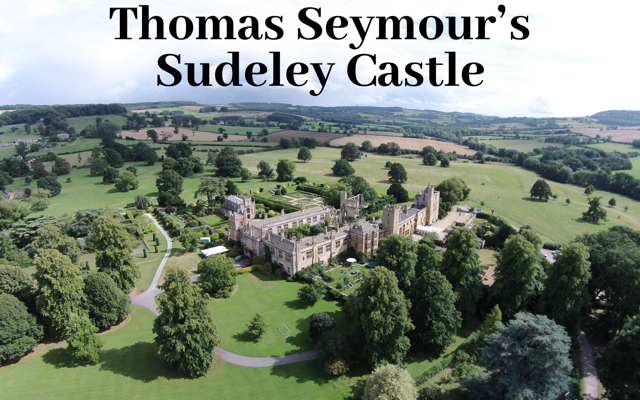 Author Cooper Willyams of “The History of Sudeley Castle, Near Winchcomb, Glocestershire” states that Thomas Seymour was believe to “have built his chapel of rich gothic architecture, of which the shell is now remaining here.” That statement was written in 1803. In 1548, the castle was ready for it’s homeowners. Seymour and Parr moved into their new home along with Seymour’s ward, Lady Jane Grey and the cleric, Miles Coverdale. Eventually, due to his reckless behavior and fear from his brother the Lord Protector, Thomas Seymour was arrested on 33 counts of treason and convicted without trial. He was executed on the 19 March 1549, afterwhich the castle once again reverted to the crown. Sudeley castle. I live in America. Yes, I read that about the Boteler family. This includes the lady that was said be secretly married to Edward IV. Love the intertwining History.